Helping clients around the world bring ideas to life through compelling creative designed with their target audience in mind. While all these projects are unique, each one started as a simple thought. These ideas were carefully developed and executed to meet KPIs, deliver maximum results. This video was produced as a tribute to current volunteers and supporters of the Military Appreciation Day activities at The Pennsylvania State University. It’s purpose was to garner interest and sponsorships from new supporters. 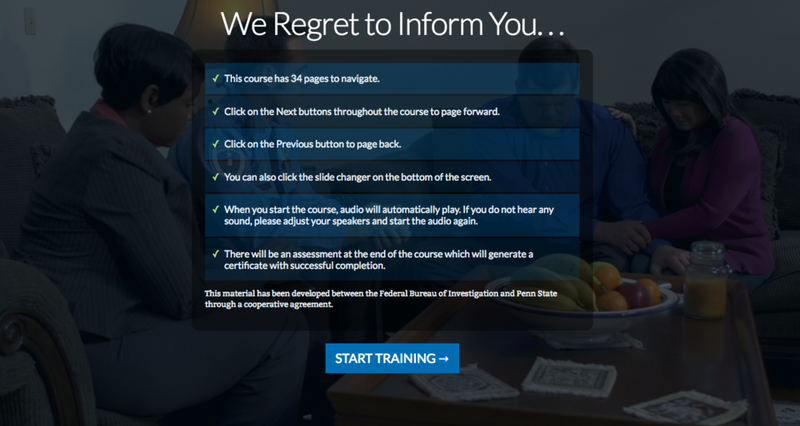 WPSU Penn State, in partnership with the FBI & Penn State University Police and Public Safety, produced online training curriculum to educate law enforcement and university authorities across the country on proper techniques to use when handling a death notification. Access the full course here. Did you know that thousands of K-12 teachers across the country are making a difference through after-school robotics programs? FIRST partnered with D S Simon Media during the 2016 FIRST Championship to produce a daily series of engaging social media content to highlight the competition. Golf professionals and enthusiasts around the world now have unprecedented access to advanced technologies through a new online course. This course was designed through a collaborative effort by WPSU Penn State and the GTRC to bring 3D Motion Analysis to a user-friendly environment engaging students through a series of interactive videos.